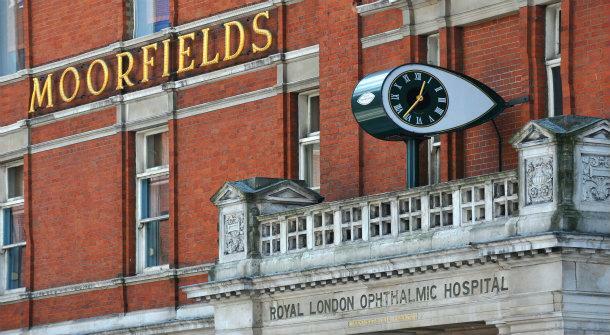 Thomson Software Solutions has won a prestigious contract to supply their computer-based test charts to Moorfields Eye Hospital and their satellite sites. The contract which will take three years to fully implement, will involve replacing all back-illuminated Snellen charts with the latest Thomson Test Chart. The charts, originally developed by Professor David Thomson, are already installed in over 8000 consulting rooms in the UK alone including many hospital eye departments. “We are very pleased that one of the best-known eye hospitals in the world has decided to install our test charts” said Professor Thomson. “We have worked very hard to ensure that our Test Charts are at the cutting edge of vision assessment while maintaining the user-friendly interface that has made the charts so popular”. 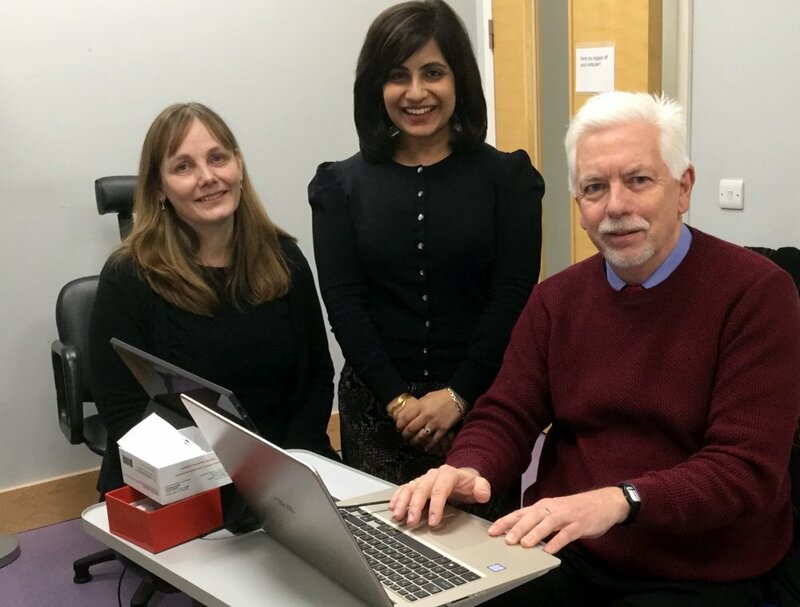 The RNIB have recently adopted the Thomson Digital Fields Screener to provide a means of screening the visual fields of patients seen as part of their domicilary service. Before the advent of the Digital Field Screener clinicians had to choose between a crude confrontation test or "lugging" a bulky field screener between visits. 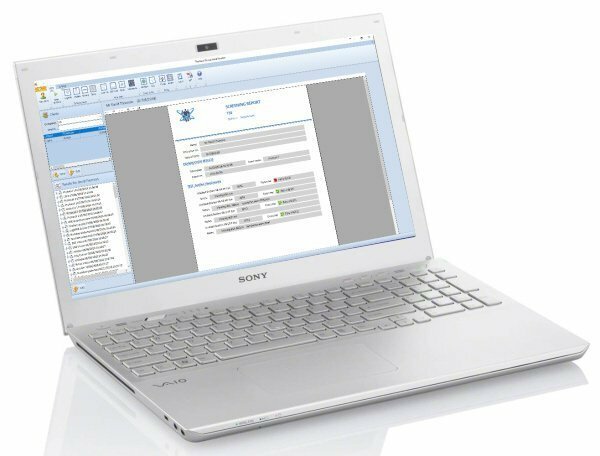 The Digital Field Screener provides a portable, fast and cost-effective new tool for the domicilary clinician. 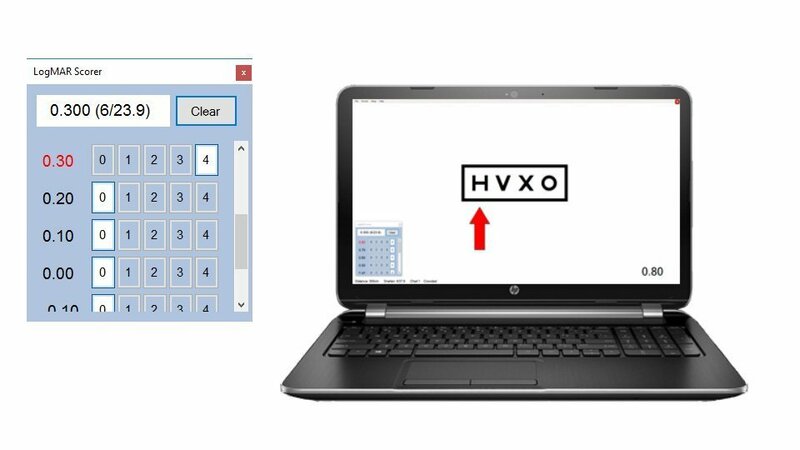 Our new Occupational Screener software is set to revolutionise vision screening in companies and industry. 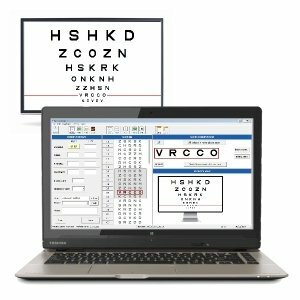 The software runs on a standard PC or Laptop and performs a wide range of vision tests including: Distance LogMAR accuity, Distance Snellen acuity, Number plate test, Distance binocular vision, Near visual acuity, Near binocular vision, DSE vision, Stereopsis, Colour vision, Visual fields and Amsler. The software is also capable of creating on-screen questionnaires to gather information about symptoms and history (and virtually anything else). The tests may be run individually or grouped into a protocol for screening specific groups of people. A pass/ faill criterion can be set for each test allowing the screener to rapidly identify those inviduals who fail to meet a minimum standard. The software includes a powerful database and report generator to manage much of the back-office administration associated with screening. The software is in the final stages of testing and will be launched in the next month or so. In the meantime, we would be very happy to provide an online demonstration. 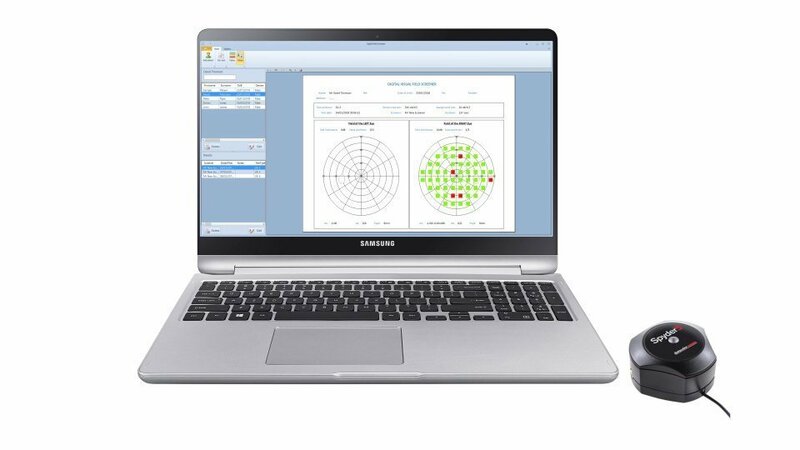 The Thomson Digital Field Screener is a fully-featured visual field screener which runs on a PC or a laptop. It is ideal for domiciliaries or as a backup in your practice. The software includes 30-2, 24-2 and 10-2 screening protocols and can be used in multiple-stimulus, single stimulus, suprathreshold and thresholding modes. The Paediatric Screening Test Chart is designed for screening the vision of children from the age of 4 years upwards. The system uses a Crowded LogMAR test and fully complies with the recommendations for School-Entry vision screening prescribed by the UK National Screening Committee and Public Health England. The software also includes an elegant app to help with LogMAR scoring. 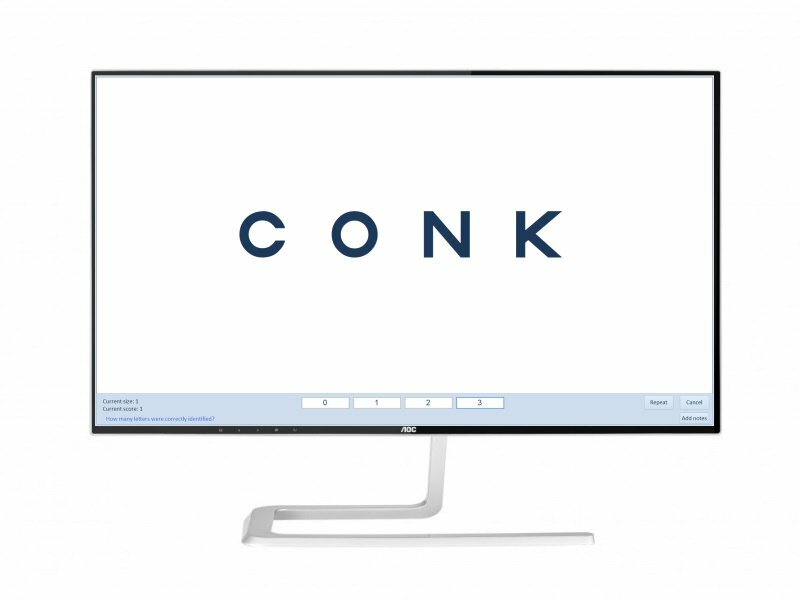 From the inventors of computerised Test Charts, we have installed our software in over 8000 consulting rooms around the world including most of the major eye hospital eye departments in the UK, all of the Optometry and Orthoptics schools in the UK and many in Europe, Australia and Asia and thousands of Optometric practices. We can supply solutions ranging from software only to complete installations. 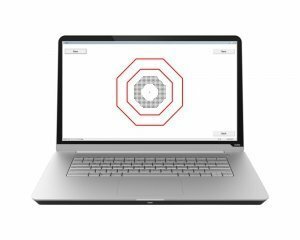 The Clinical Eye Tracker provides an exciting new tool for assessing eye movements and binocular vision at a breakthrough price! The system uses a small bar which is mounted below a computer screen. The bar incorporates IR cameras which detect the position of the eyes to within less than 1 degree. The most exciting thing that has happened in binocular vision testing since the invention of the cover! We supply a complete range of solutions for diagnosing and managing Meares-Irlen syndrome (Visual Stress). 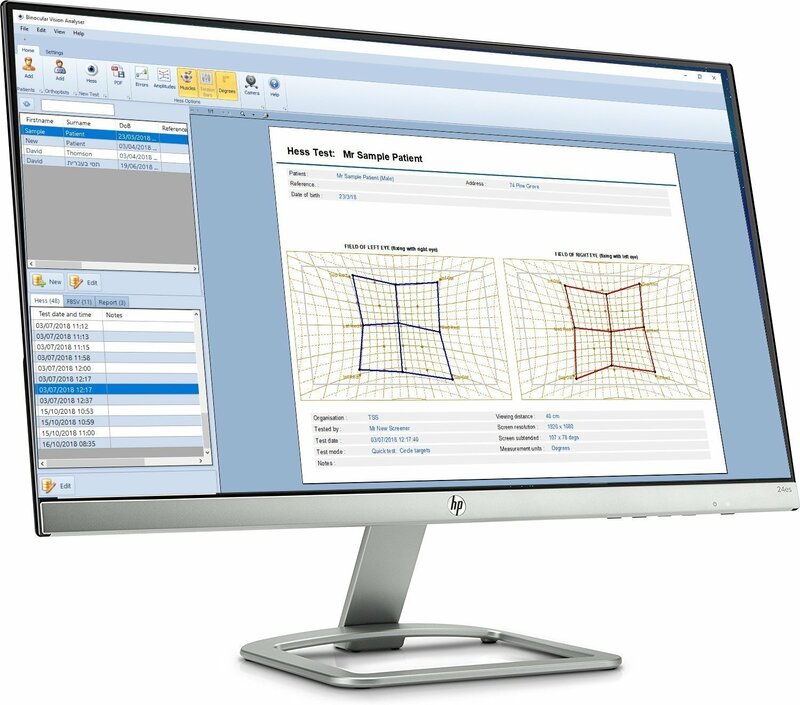 Our screening software rapidly identifies those who are likely to benefit from colour and determines the optimum colour for overlays, lenses and their computer screen. A complete solution for use in Hospital Eye Departments and clinics - includes advanced Hess Screen, Field of Binocular Single Vision and Orthoptic report. Available as software only or as a complete solution with touch-sensitive PC, 48'' monitor and bespoke instrument table. 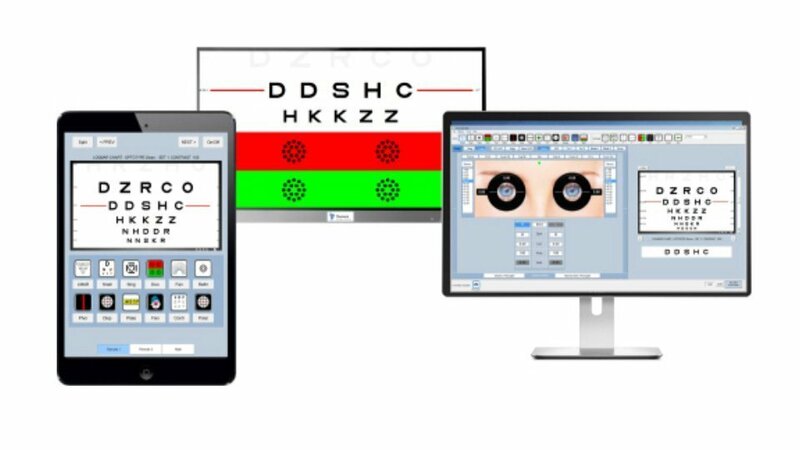 The PC Hess Screen provides the clinician with a powerful PC-based tool for assessing ocular motility, without having to invest in bulky and expensive equipment. Quickly and accurately measure deviations in 9 or 25 directions of gaze, save results, print reports and much more. 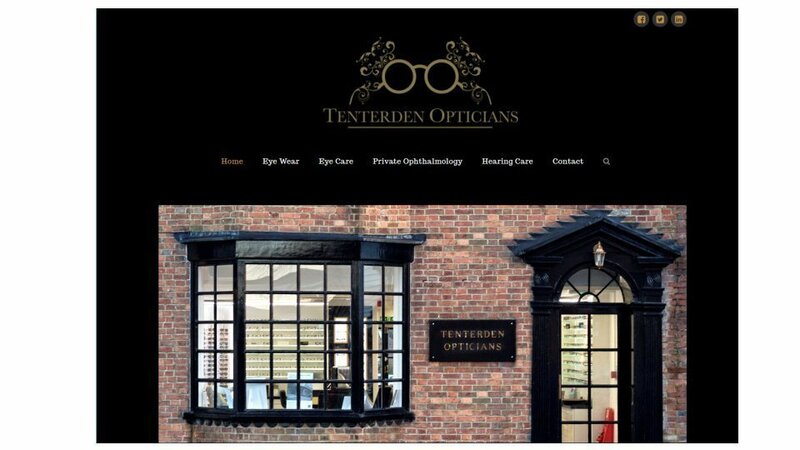 With years of experience of providing software to the Optical Sector, we are ideally placed to create a stunning website for your Optical Practice. Whether you are looking for a simple starter site or a full ecommerce site, we can help. Why not give us a call to discuss your requirements. 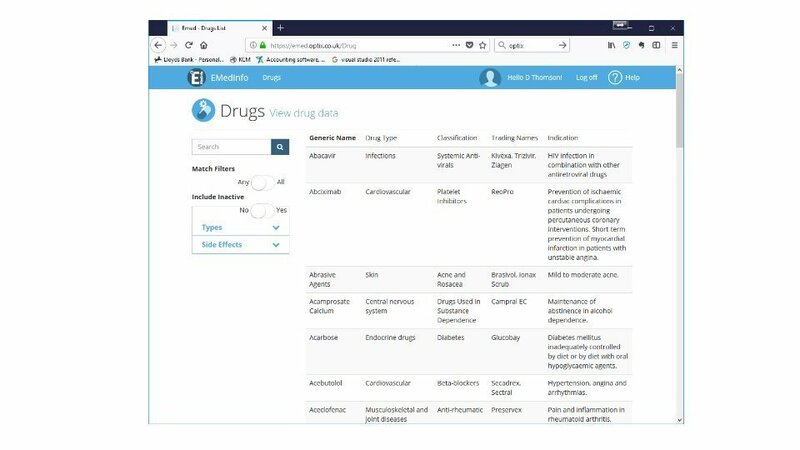 EMedInfo - a unique database of the ocular adverse reactions to over 3000 drugs, has become a firm favourite among eye care professionals. We are proud to announce that we have now joined forces with Optix and Aston University to launch an updated web-based version. Access this unique database from any device for just £5 / month. 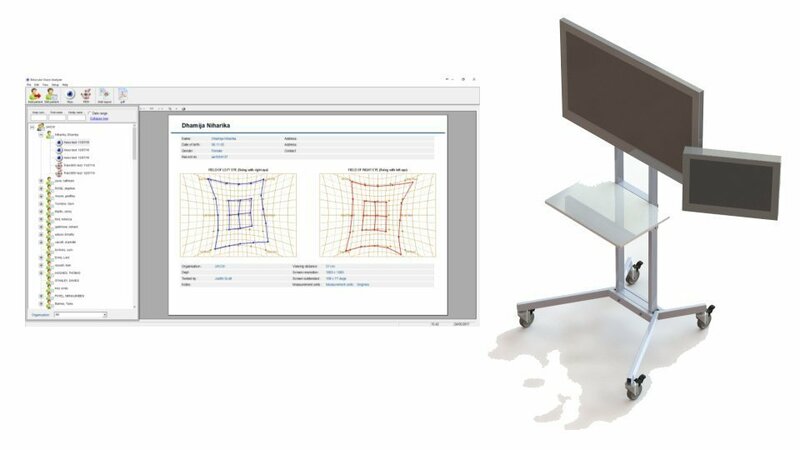 D-Chart is a novel system for mapping and quantifying distortion in the central visual field. Ideal for vitreo-retinal clinics, optometrists or others who wish to monitor changes in central visual fields. At last, an alternative to the Amsler chart. 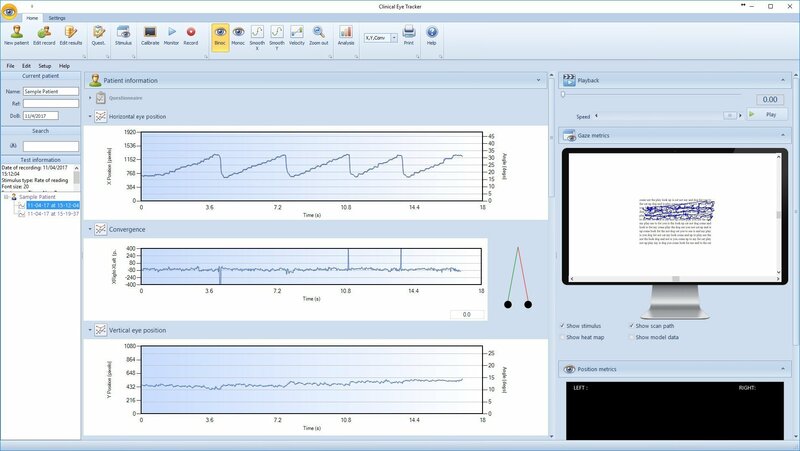 Acuity Master is our radical new solution for measuring and analysing visual acuity. Perfect for hospitals, clinics and other environments where accurate assessment of visual acuity is paramount. Acuity Master takes care of the entire process, including measurements, scoring, and reporting. A range of products for helping explain eye conditions to patients. All contain high quality animations storyboarded by eye care professionals and produced by the leading developer of medical animations in the UK. Turn your iPhone or iPad into a powerful vision assessment tool. 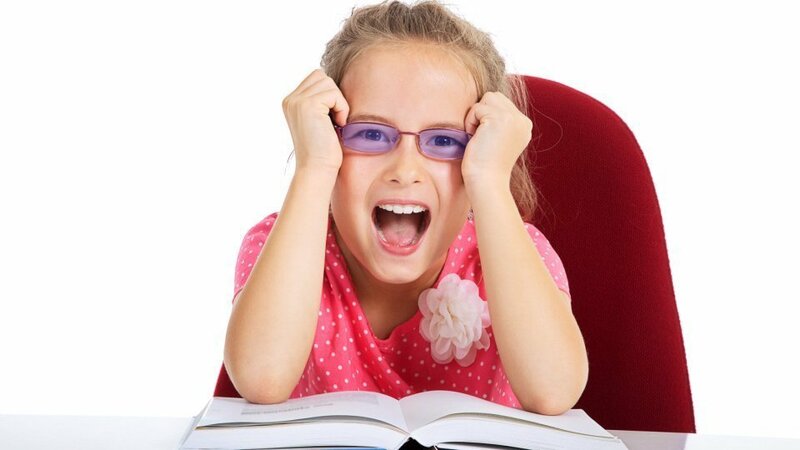 Huge range of near vision tests, 3m vision tests, images and optical calculators. 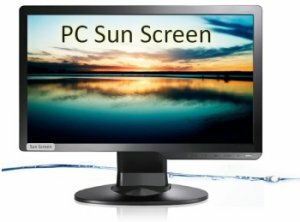 PC SunScreen is a powerful software app which automatically adjusts your screen colour to mimic natural daylight, gradually increasing the blue content from dawn to midday and then reducing it in the hours before you intend to go to bed. Research has shown that this can have a significant impact on sleep patterns. A number of other products have been developed by the same team but are marketed and managed by sister companies. For further information on these products, visit the associated websites from the links below. Thomson Screening is a spin-out company from City University which markets innovative software developed by Professor Thomson for managing Vision, Hearing and Height/Weight screening in schools. The flagship software is already in use by ten local authorities and co-ordinates a screening programme across a whole area. We have developed a Health Screening kiosk for use in public spaces. Ths kiosk is capable of assessing distance and near vision, blood pressure and weight / BMI. Contact us for further information.